On Saturday, the large white tent was filled to its 750-seat capacity, and easily there were dozens upon dozens more wherever one looked, standing at the perimeters. 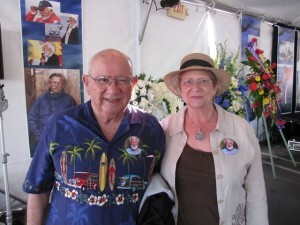 They had come to the Cabrillo Marine Museum for the public memorial celebration that honored and bid farewell to San Pedro’s favorite son, John Olguin, who had passed away on January the first, a few oar strokes shy of his 90th birthday. Harzen, with Barbara Brunnick and Mike Schaadt, the latter being the Cabrillo Marine Museum’s current director, have penned John Olguin: The Life of an Oarsman, forthcoming this spring. “He was a friend who taught us to love the ocean and its animals and creatures from the teeny, tiny grunion to the mighty whale,” said City of L.A. Councilwoman Janice Hahn. Olguin’s notable awards ranged from the Silver Star he received for his service fighting in New Guinea, the Philippines, and Japan during World War Two, to being named San Pedro Citizen of the Year in 1978, Honorary Mayor of San Pedro in 1987, and Citizen of the Century by the Los Angeles Times in 1999. Citizen of the Century? Well, the San Pedro Rotary Club named him Citizen of the Millennium in 2009. Now that’s tough to beat. Hahn recalled his appearance each Fourth of July at the Korean Bell at Angel’s Gate, on the grounds of old Fort MacArthur. He’d ring the bell for each of the original thirteen U.S. colonies, and then once more, for the peaceful reunification of Korea. Olguin was also back at the Korean Bell each December 31 to ring in the New Year. On this most recent occasion, an hour or two before the midnight hour, it was delightful to mingle with the enthusiastic Korean-Americans who had made the annual trek or pilgrimage to the bell in hopes of a better future for their divided country. Their anticipation of the bell ringing was palpable. After Olguin arrived, he complained of not feeling well, and left early. 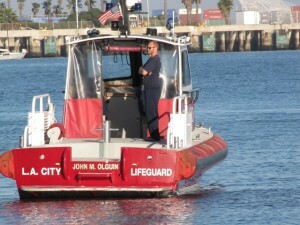 The L.A. City lifeguard boat, John M. Olguin, paying its final respects. The next morning, as Hahn and others prepared for their annual Polar Bear Club dash into the frigid waters of Cabrillo Beach, they learned that Olguin – who was always at this event as well – had left us. Hahn remembered the first time she’d gone for a dip with the other Polar Bears and how Olguin had playfully dunked her. Don’t worry, he’d said, I’m a lifeguard. Not only a lifeguard, as were some of his brothers, but eventually Lifeguard Captain. At the end of the memorial celebration, the L.A. City lifeguard boat, “John M. Olguin,” made a special appearance, backing up close to shore so that all of us on the beach could read the name printed on the stern. It was on that same beach that kids used to throw firecrackers and launch bottle rockets on the Fourth of July because the city couldn’t afford a fireworks show. Olguin came in and took care of that, too. Hahn referred to Olguin as the Will Rogers of San Pedro, and that comparison is apt, a bit more so, perhaps, than Reverend Neal Neuenschwander’s likening him to a mixture of Santa Claus and Pee-wee Herman. Better, maybe, to summon up a visage and gravitas equal parts Homer, Whitman, and Victor Hugo. What John Olguin may have had over these latter three men is that nearly everyone who knew him considered Olguin to be like their favorite uncle. When he was told on the morning of the first that his older brother had died, Albert thought: “Aw, man… There were six of us guys” – and he went down the list of his male siblings until he got to himself. If Albert Olguin was able to crack up his audience, he was also able to move them to tears. He remembered sitting with his brother and John talking about one day being called to “a better place.” But John must have taken a good look around and, there at home in the community he’d lived in virtually his entire life, he told Albert that, right now, there’s no better place than this. When Albert sat down, he was given a standing ovation. If we’d been sitting in an amphitheater in ancient Greece, the speaker might have given us a slightly different afterlife tale, in which Charon is rowing Olguin across the River Styx, only to have John say, Here, give me those oars; let me show you how it’s done. Reverend Neuenschwander also pointed out a certain prescient quality that John Olguin was noted for, but which was really his lifeguard’s eye, that is, his ability to spot impending trouble and then to defuse it before it could actually happen. He also noted, as other speakers did too, that John’s motto was simply “do it.” He was a man of action, all the way. And another thing about knowing John, the Reverend said, is that after you got to know him you’d realize that you’d never measure up to him. When Lou Mannick first met him in the 1970s, he told his wife, artist Candace Gawne, that this was the man he wanted to be when he grew up. One of the pleasures of the First Thursday Art Walks in San Pedro has always been the chance to visit Candace’s studio in The Loft and to often find Lou sitting in a chair just outside of it and wooing visitors by playing his Sears Craftsman saw as if it were a violin, and making it sound like an opera singer. 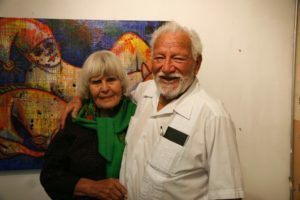 John and Muriel Olguin’s art studio is just a few steps around the corner. Behind every great man is a great woman, and Muriel has been that great woman, to whom John was married for 62 years. They have three children, Vi, Monica, and John Cabrillo. The latter was named after Juan Cabrillo, the Spanish explorer who touched down in these parts, presumably Cabrillo Beach, a few centuries back. Many years ago, this writer took an overnight boat trip to San Miguel Island, off the coast of Ventura. It’s sort of the Pluto of the Channel Islands, windblown and desolate, but the Olguins, father and son, plus a few others conscripted for the occasion, donned conquistador outfits and reenacted the very possible landing of Juan Cabrillo on the shores of San Miguel. Muriel’s paintings have been in many local art shows, thanks in part to friends and admirers like artist Dorota Starr, who prompted an exhibition at Medea Gallery of Muriel’s work a year or so ago. 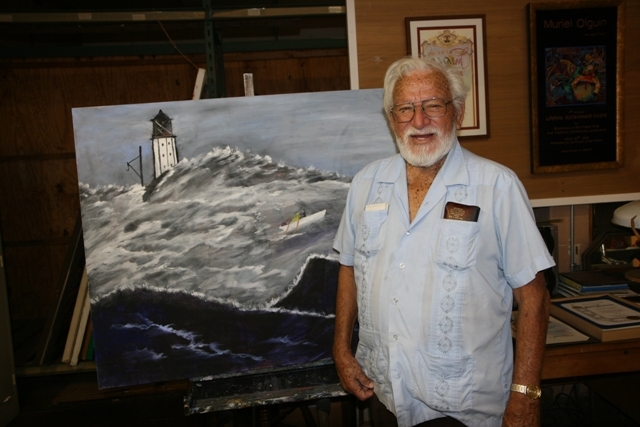 John’s painting is less well known, and most people may not even be aware that he painted, but his pictures capture the magnificence and immensity of the sea that he and Muriel experienced firsthand. Their stories of rowing up and down the coast, or from San Pedro to Catalina and maybe all the way to Hawaii and back for all we know, are legendary. But that’s no surprise, because what did John do that wasn’t legendary? And to that we can say, Amen, and God bless. Olguin was quite the guide, informative as usual, but also entertaining with his array of whale imitations. The coastline that faces away from the mainland is very different, rugged and seemingly inhospitable. Sheer cliffs drop straight into the sea. A few days later, but before his official retirement as its director, I met up with Olguin at the Cabrillo Marine Museum. He looked back over those 50 years, and he also looked ahead. “I love the ocean, I always have. I was born where I could see the ocean, and I want to spend as much time out there as I can, in the water. Behind the public eye, however, Olguin had important plans, which later came to fruition, such as arranging for a statue of Senator Stephen M. White to be placed near the museum, and restoring the Point Fermin Lighthouse to the way it was in 1874. Even before he became a lifeguard in 1937, Olguin spent as much time by the water as he could. “As a youngster, I’d get up and ride my bicycle to Cabrillo Beach before I went to school, and I’d go swimming at 5:30, 6:00 in the morning. Ride back, have breakfast, and get to school by 8:00. And then when I became a lifeguard, well, I thought, this is all I ever want to be: I have achieved by goal in life; I am now a lifeguard. And I had no idea that I’d ever want to be anything else but that. At the same time, Olguin had a profound respect for the ocean and he knew what could result if one entered the sea unprepared. He spoke about rowing to Catalina with Muriel and thinking little of it. “No big deal,” he said. “Why? We just take a gallon of water and a loaf of bread and some warm clothes because we know it’s going to get cold. We know It’s going to take ten hours. And we know that if we start early there’s nothing to it. And we row back; again there’s no big deal, nothing to it.